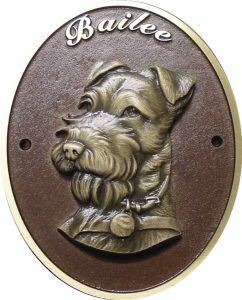 When you need a beautiful and respectful plaque to memorialize your family pet, choose a bronze or aluminum pet memorial plaque from Erie Landmark Company. We specialize in casting high-quality and timeless aluminum and bronze plaques and pet grave markers that you can revisit for many years to relive pleasant memories and experiences with your beloved pet. Why Select a Bronze or Aluminum Pet Memorial Plaque? Bronze is a popular material for creating markers and plaques because of its timelessness and simple elegance. It is unique and is often used for historic markers, signage and memorials because it is durable, attractive and corrosion- and weather-resistant. By choosing a bronze pet memorial plaque or grave marker, you’re ensuring it remains a comforting place you can visit and reminisce for many years to come. Aluminum is another popular marker and plaque material choice because of its look, durability and affordability. Aluminum offers similar durability to bronze while providing a sleek look at a fraction of the cost. We use the highest-quality aluminum to ensure that your pet remembrance plaque can withstand the rigors of the outdoors. Style Variety: We offer 10 distinct styles to commemorate your pet. Browse our examples below to choose the style that best fits your needs. Material: All plaques are available in either bronze or aluminum. Sizes: Depending on the style you select, sizes can vary from 4×4 to 13×9. Finish: To ensure it lasts, our plaques are crafted with a clear protective coating to keep the natural finish intact. Unique Hues: Select from standout color options ranging from black, brown, carnival red, royal blue, hunter green or natural. 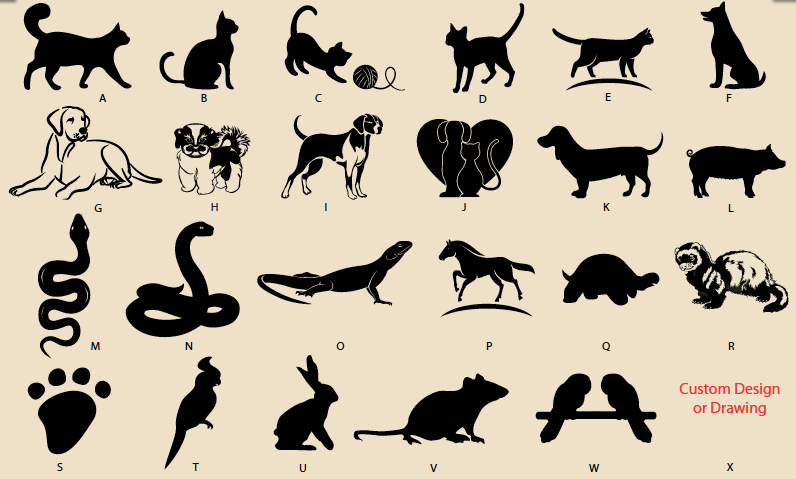 Design Options: For added personality, we offer 23 different standard pet design options. We can also create a custom design for an additional fee. Font Selection: For added flair, we offer 10 different standard font choices or for an additional fee, we can incorporate a customized font. Customized Text: Add three lines of customized text to your pet memorial. Full Customization Options: If our standard design options don’t quite fit your desires, work with our designers to create a unique option. Bas-relief is a unique, traditional, low-relief sculpture technique. Creating these images is time-intensive but it adds undeniable depth, character and style to your bronze plaque. Another benefit of a bas-relief image is that it will differentiate your aluminum or bronze pet memorial plaque from other mass-produced memorials. When you need a unique, customized pet memorial plaque, trust the artisans at Erie Landmark Company — a division of Paul W. Zimmerman Foundries. We understand your unique needs and want to give you an elegant and respectful aluminum or bronze memorial plaque that you can visit for many years to come to relive fun memories and events. In just four to six weeks, our expert craftspeople can create your plaque and have it delivered to your door. For added assurance, we offer a five-year warranty, for normal wear and tear, on all of our pet memorial plaques. To design your beloved pet’s aluminum or bronze memorial plaque, call one of our team members today at 800-874-7848 or complete our online contact form. Below are the 10 styles of our pet memorial plaques. To view pet design options, click here. To view font styles, click here. If you’d like to fully customize your plaque, call us at 1-800-874-7848 or submit our contact us form.